Cliff walking advice has been issued after two girls were rescued on West Hill in Hastings on Sunday (September 20). East Sussex Fire and Rescue Service is urging the public to be vigilant when walking on cliffs after assisting in the rescue of the 13-year-olds. One of the girls fell and when her friend tried to help, she also became stuck. The fire service recommend letting someone know where you are going and what time you are likely to be back. Informal paths leading to beaches can be dangerous and are best avoided. If you are crossing a beach, make sure you know the tide times so you will not be cut off. Keep to the path and stay away from cliff edges - follow advisory signs and waymarks. While it is tempting to go close to cliff edges to peer over you should stay back from them, some cliffs overhang or are unstable and this is not always obvious. Take particular care when the grass is short, as it can be very slippery when wet. 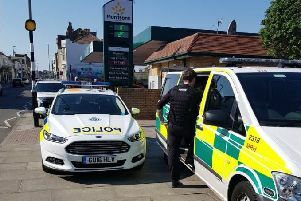 Three fire crews from Hastings were mobilised at midday along with paramedics and the coastguard, who worked together to rescue one girl who was then transported to Royal Sussex County Hospital Brighton by helicopter. The second girl was led to safety and managed to walk away from the incident. Take particular care when the grass is short, as when wet it can be very slippery.